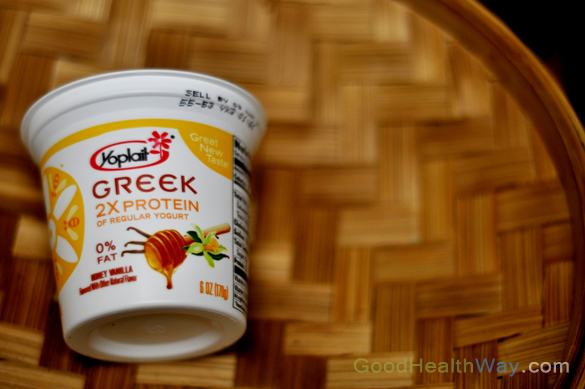 Feb 2012 – Had a first Yoplait Greek Yogurt and chose their Honey Vanilla variety. Having tried Chobani and Oikos Greek Yogurt, and thinking this brand of Greek Yogurt should be really really good like the other varieties of Yoplait. The taste was good except there was very little honey taste. Upon reading the ingredients, there IS NO HONEY listed. There is Milk, Lemon Juice, Corn Starch, Natural Flavor,… but no honey listed. So, the yogurt was good and has all the goodness of all of the other brands of Greek Yogurt but wouldn’t consider this the best Greek Yogurt. Will review other flavors of Yoplait Greek soon. Oh, and this is GLUTEN FREE. Hop on the Greek Yogurt Train, it is GOOD.